Posh fans must be missing August. Two days after boss Grant McCann received the manager of the month after four straight league wins, and Jack Marriott won player of the month for six goals, Posh lost their spot at the top of League One after a successive win-less performance. But in truth they came up against a ruthless Bradford side who now sit level with Posh on points, albeit with a worse goal difference. A goalkeeping error and two set-piece headers led to goals for Dominic Poleon, Romain Vincelot and Matthew Kilgallon and condemned Posh to a first league defeat of the season. The result knocked them off the top spot, despite Jack Baldwin’s second-half consolation. And the afternoon got worse as Antony Grant was sent off just before the end for a deliberate handball as the visitors broke, although it was soon 10 v. 10 as Adam Chicksen also received a second yellow for a late lunge. This fixture finished 4-0 to Bradford two seasons ago and it looked like a repeat could be on the cards after an incredible first-half for the visitors. 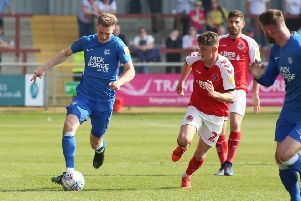 Posh failed to defend crosses into their area well enough and received an early warning of what was to come when the excellent right-back McMahon crossed, but Jake Reeves’ header was well saved low down by Jonathan Bond. However, the goalkeeper who has been excellent since joining on loan from Reading failed to catch Chicksen’s hanging left-wing cross a few minutes later as he entered a pile of bodies. The ball came out to Poleon who fired home into the unguarded goal. The striker then mis-kicked in front of goal after a clever corner, allowing Posh to break. Despite Marcus Maddison being cleaned out by Alex Gilliead the ball went right to Jack Marriott but his low shot was saved comfortably by Bantams goalkeeper Colin Doyle. A deep Maddison corner was then headed back across goal by Steven Taylor and worked towards goal by Ryan Tafazolli, but the weak effort was cleared off the line. The home side were enjoying a decent spell and Maddison displayed some brilliant skill to flick the ball past ex-Posh defender Nathaniel Knight-Percival. After collecting the ball he then tried to chip Doyle from long range but his audacious effort went over the bar. Yet once again Bradford came back strongly. Vincelot flicked a header wide from a McMahon free-kick, but minutes later he stooped low to head in the full-back’s corner from the right. A few minutes later and another free-kick led to another goal as again a Bradford player was allowed a free header at goal. This time it was Kilgallon who made no mistake at the near post. The visitors had let a three goal lead slip in their previous away trip to Bristol Rovers, which they drew 3-3, but a repeat was never on the cards this time, although were indebted to Kilgallon for clearing a Morias volley off the line and then to Doyle for his flying save to keep out Maddison’s curling effort. McCann had brought on Andrew Hughes and Jermaine Anderson at the break for Tafazolli and Michael Doughty and Ricky Miller then replaced Marriott on the hour for his Posh debut having served a six game suspension for biting while playing for Dover. And it didn’t take long for the boy from Bretton to grab the attention as he went past Vincelot before going down under a second challenge, only to be booked for diving. A melee then occurred in front of the home fans which saw Morias and Grant booked, much to the anger of the supporters. However, jeers turned to cheers with 20 minutes to go as Maddison’s corner from the left was not cleared and Baldwin fired in low from 12 yards. But there was to be no grandstand finish as Bradford saw the match out comfortably, although there was still time for both players to have a man sent off. First it was Grant who stuck his arm out to block a pass as Bradford broke, then moments later Adam Chicksen lunged in on Da Silva Lopes and also received his marching orders. Peterborough United: Jonathan Bond, Steven Taylor, Jack Baldwin, Ryan Tafazolli (sub Andrew Hughes, 45 mins), Leo Da Silva Lopes, Michael Doughty (sub Jermaine Anderson, 45 mins), Anthony Grant, Gwion Edwards, Marcus Maddison, Junior Morias, Jack Marriott (sub Ricky Miller, 61 mins). Unused substitutes: Conor O’Malley, Chris Forrester, Idris Kanu, Danny Lloyd. Bradford City: Colin Doyle, Tony McMahon, Nathaniel Knight-Percival, Matthew Kilgallon, Adam Chicksen, Alex Gilliead (sub Omari Patrick, 75 mins), Jake Reeves, Romain Vincelot, Nicky Law, Dominic Poleon (sub Paul Taylor, 80 mins), Charlie Wyke. Unused substitutes: Lukas Raeder, Adam Thompson, Shay McCartan, Tom Field, Alex Jones.